If you do something then do it. Go all out." Arnold Schwarzenegger. The King of Kings, our Lord of Lords. It's been a visible month for The Oak as the first weekend heralded the return of the Arnold Sports Festival in Columbus, Ohio. Starting in 1989 with a focus on bodybuilding, the event has turned into a long weekend extravaganza of competition, athletes, exhibitors, vendors and more. Nearly 200,000 attendees travel from around the world to attend the mecca of fitness with fencing, gymnastics, cheer leading, bodybuilding, martial arts, archery, power lifting, table tennis and WWE all part of the mix. An Australian version popped up this year as well. In attendance Arnold cheered on a new world record in dead lifting and sat down with goers for an intimate chat. On the movie front, rumors of a new Conan film shooting in the fall have been rampant as Terminator: Genisys ramps up for a July release. Arnold graced the cover of Empire Magazine recently and promotion will kick into high gear soon. Just today, the delayed and somewhat mysterious zombie project, Maggie, saw it's first trailer hit the internet. In what looks like a dramatic take on the genre, Arnold stars as the father of a young girl turning into a zombie (Abigail Breslin). It looks surprisingly low key and dramatic with response being very positive and surprised at Arnold's emotional depth. This is the guy who convincingly played a naive virgin in Twins so I've always known he had talent. Hitting theaters in a quick to be here May 8th, it will be interesting to see how Maggie performs in the wake of recent enjoyable flicks but box office misfires The Last Stand and Sabotage. On the small screen, Arnuld popped up on the finale of Two and a Half Men playing a cop in a funny performance that was the best part of that non-Charlie Sheen appearing but totally dependent on Charlie Sheen piece of sh!t. The Oak also made an appearance on the new Late Late Show, whipping host James Corden into shape at the gym. On the society front Arnold continues his crusade to fund after school programs as they promote improved attendance, graduation rates, health and wellness. Data shows that juvenile crime reaches it's peak between 3:00 and 6:00 PM, the most likely time kids are unsupervised. 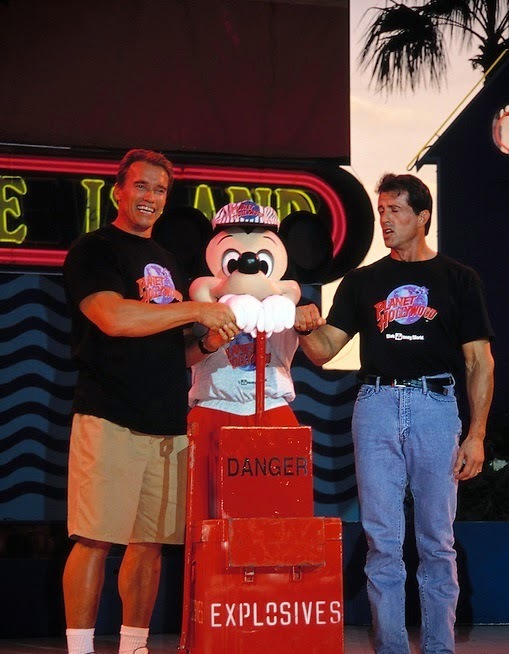 If affecting the lives of millions wasn't enough, Arnold also took the time to brighten the day of one demoralized gym goer. After falling in the gym to the laughs of onlookers, the young man took to Reddit where Arnold chimes in frequently. Upon hearing about this one case, Arnold again showed how awesome he is by telling the kid not to be afraid of failure. He fell down, big deal. Everyone has to start somewhere but all he has to do is get back up and take another step and keep moving forward. That's why Arnold is the greatest. How do you climb a mountain? By going up!